Looking at the calendar, It was not clear to me what the next race choice should have been. Logan and Marissa are going to be busy will soccer pretty soon. I had not been running much during July in an attempt to recover from Track. 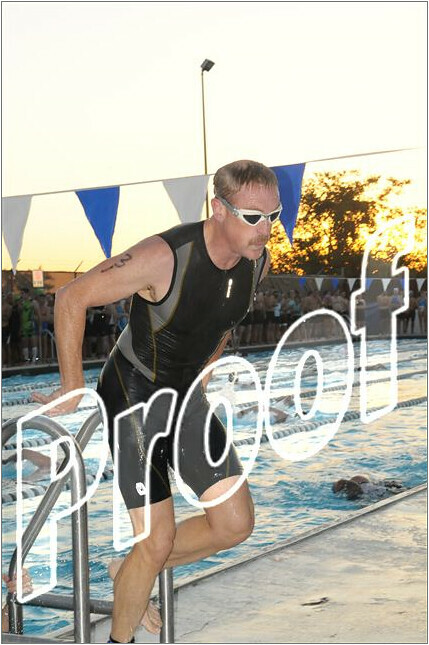 But I had been hitting the swim really hard with Ron and also I had been working hard on the bike. It has also been so damn hot, that it just seems like a beating to do a race. When I noticed that they were going to do a 6:45am start for this one, I was swayed, throwing caution to the wind, I signed up on Saturday for Sunday's event. It took me around 45 minutes to drive up to Denton. I had my bike racked and ready to go by 5:45. I waited until six to jump into the pool and start warming up. It was a good thing I got in the pool early, because it was dark and the guards would not allow more than three people in the pool at one time! I knocked out a solid 700 warmup - which I thought was Long Course Meters - which is what the race advertised, but based on my swim time - it was clear that this was an old 50 yard pool. This pool is also outside and so the water temp was 90 degrees. TWU has an indoor 50 Meter pool - so its puzzling why they dont use that one for this race instead. I was pretty happy with my first transition. 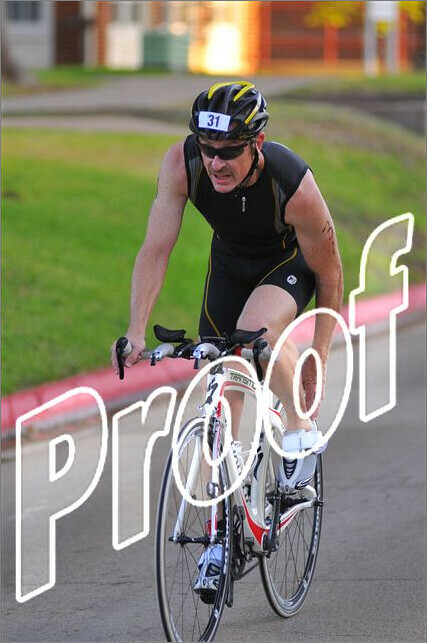 I had to run the length of the transition area up hill. I was on the bike pretty quickly and it was not too long before BenD came hammering by. I was "on the rivet" the whole way. Most of the bike was without issue, except for the turnaround. I arrived at the turnaround spot at exactly the same time as the race marshal's motorcycle. The knucklehead driving the motocycle, came to nearly a complete stop as he tried to navigate around the cone. This blocked my path and slowed me way down. 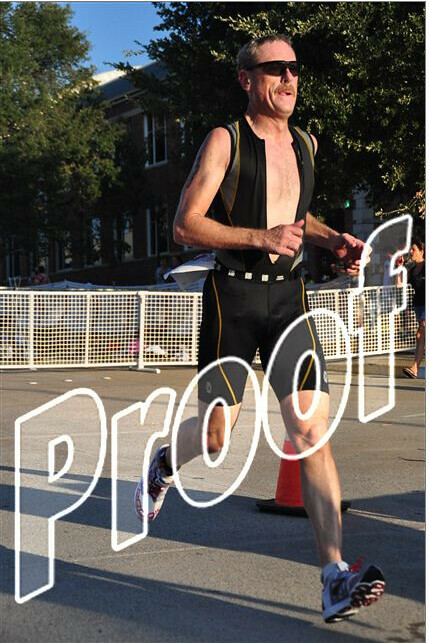 Its generally not a great thing to yell at the race marshall, but I was so pissed, I was screaming at them to get out of the way. There was a cop there as well, and heard the cop yell at this guy, "what the hell do you think you are doing?" Throughout the bike, Ben and I passed each other at least five or six times. I finished in 42:17 for a 22.8 average velocity which was 10th overall and I am pretty sure this must be my best performance on the bike ever. By a bunch. T2 went very smooth. I quickly passed a couple of guys. BenD was out in front of me, hammering it. I was dumping water on my head at every aid station - I think that there were four of them. And they had paper towels that had been soaking in ice water as well. THAT was awesome. I was running out of gas, but managed to find enough of a gear to hold off the guy in back of me - who was closing fast. And it turned out that guy was from Murphy Texas! Wow! My run time was 21:21, not a great time, but I was pretty happy with the effort given my recent training. That was top 11 for the run. Maybe that is the first time ever that my bike was better than my run! Logan taught me this trick with the tongue! That put me at eight overall. Adam Wilk finished second and took the masters award. 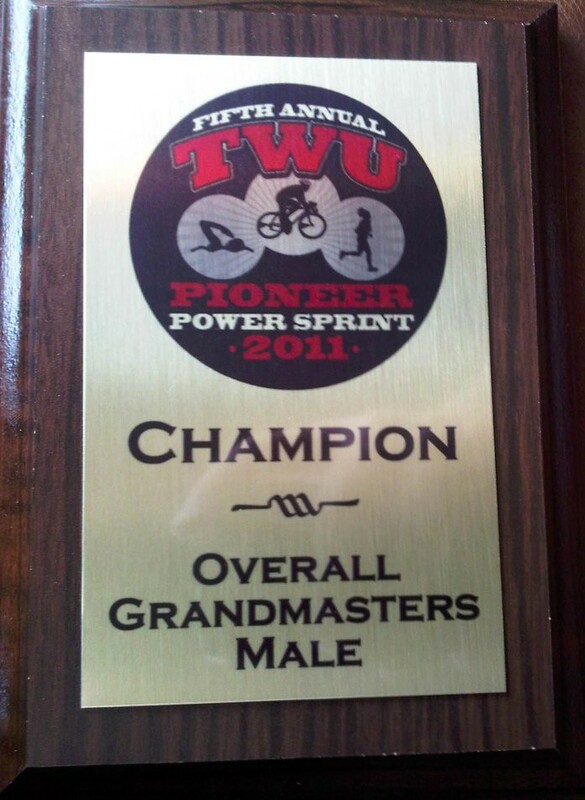 As such I was presented with the dubious distinction of earning my first ever "Grand Masters" award. Good Grief. Overall pretty good result considering everything!